A mammoth session of listing antique and vintage unsold stock from Thame Fair was undertaken this week, and I am pleased to say that all kinds of old treasures are now available. And even though quite a few pieces have already been snapped up, there are still plenty available to purchase. 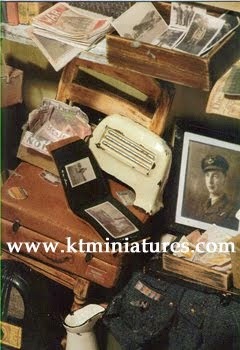 Please take a look at the various pages within the KT Miniatures' Antique & Vintage Index. 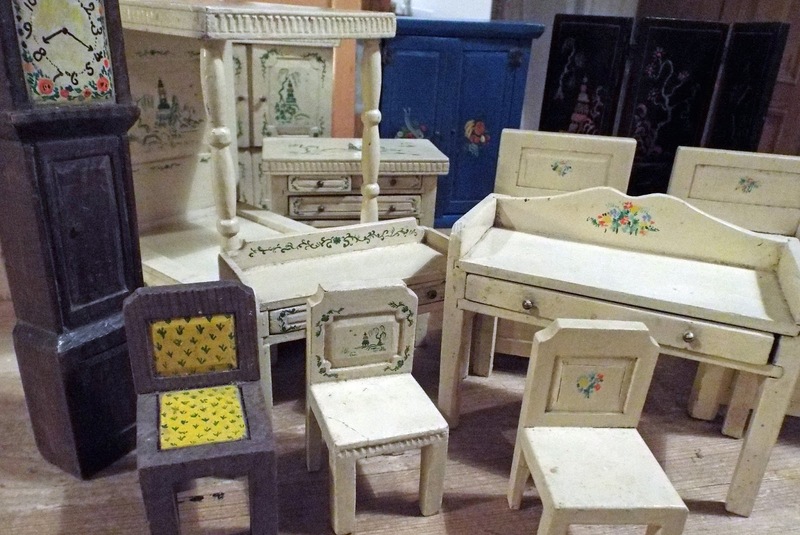 However, the rare 1920s Bertha Penrose & Ralph Wright furniture (they had connections to the Bloomsbury Set) simply flew off the shelf immediately and have either been sold or reserved whilst payment is being sent. 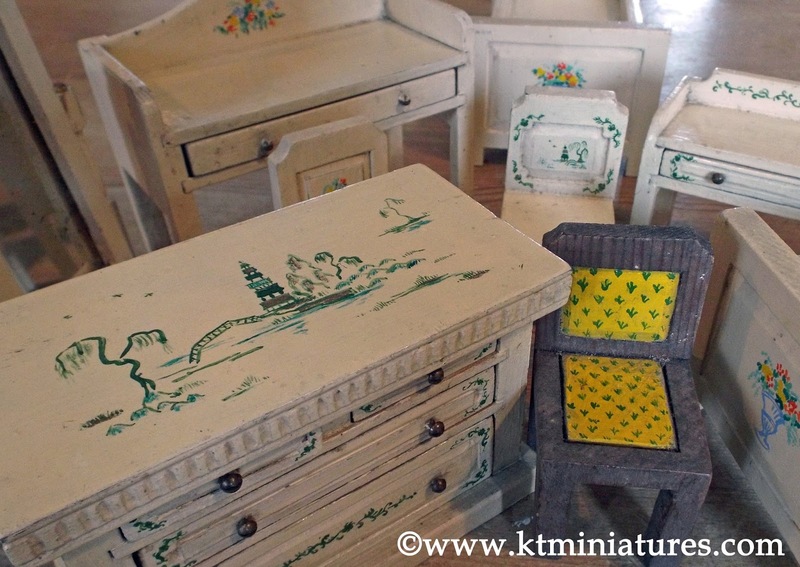 This furniture has caused a lot of interest and I have to say that I have kept several pieces of the collection for myself....as I just couldn't part with it! These pieces are quite extraordinary, even more so with their very special provenance. 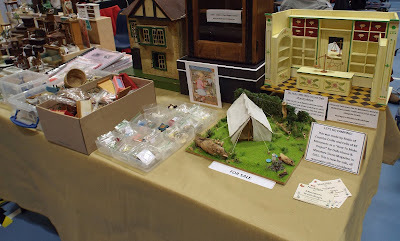 Consequently, Rebecca Green has asked if I could write something about the collection for the next issue of her website's Dolls Houses Past & Present online magazine. I hope to gather as much information as I can and feature photos of all the items, including some that I have kept that you would not have seen as yet! Oooh Err.....Apparently Thame Had An Earthquake Here Last Night...And I Slept Through It All!!! It is not often (thankfully) that Thame (a small sleepy Oxfordshire UK market town) hits the news but apparently Thame hit the main news today and I have been blissfully unaware of it all...as I was busy being imaginative with packaging due to a sudden influx of lots of lovely orders and a sudden lack of suitable boxes! And then Robin, my Nostalgia In Miniature Workshop colleague and fellow Thame resident, informed me that we were practically on top of the epicentre of an earthquake last night. Ummm...and I slept through it all! Ha ha...and apparently so Robin did too...perhaps its our age! Thankfully it was only a magnitude of 2.3 and the worst that happened was that neighbours and fellow Thame friends were shaken in their beds/houses momentarily and some talk about hearing something that sounded like an explosion or big bang? Oh well...there we are then. 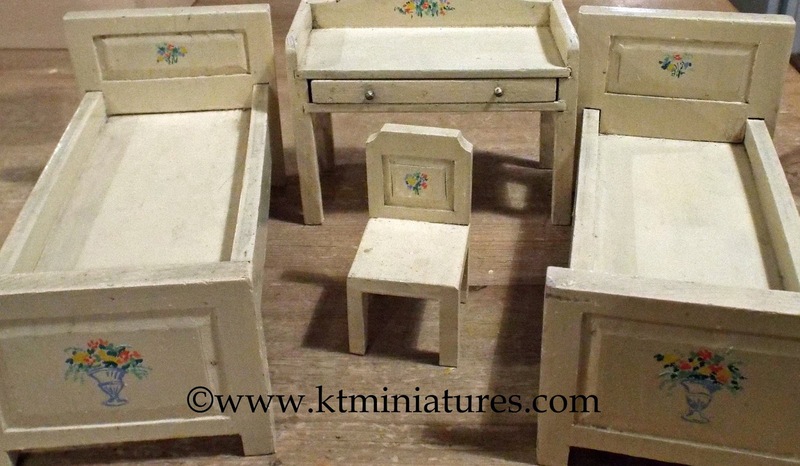 Am just starting to list the various remaining c1920s Bertha Penrose/Ralph Wright (connections to the Bloomsbury Set) antique dolls house furniture to KT Miniatures' website that were left unsold from Thame Fair. But the whole process is taking ages and it will probably be tomorrow now when the button is pressed to make it go live. These are only just some that are going up for sale - there are other pieces too, all being rather rare and quite special that just don't come along very often. 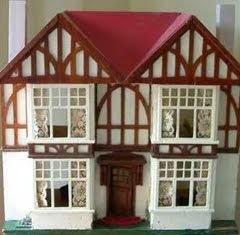 Handmade Dolls House Items Now Up For Sale & A Little DCA Hoover In Aid Of Charity! 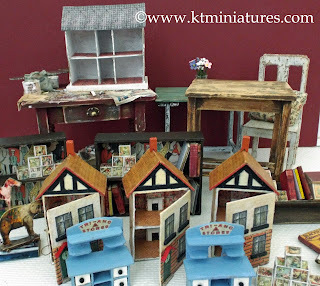 At last am delighted to say that all of the newly handmade dolls house items that were left unsold from last weekend's fair, are now well and truly up for sale on KT Miniatures' website. Although already, some are being snapped up! All handmade items can be found on the pages of KT Miniatures Little Handmade Emporium. 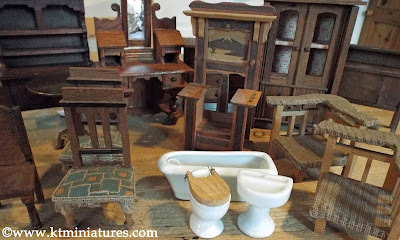 My next task is to list all the antique and vintage dolls house items that were left unsold from last weekend too. These will take even longer to list as there are more of them...but hopefully some will go live on Monday, beginning with the rare c1920s Bertha Penrose/Ralph Wright pieces! However, as it is Mothering Sunday tomorrow here in the UK, my kids have told me that I must have the day off, so am hoping to be waited on hand and foot..ha ha! So ladies...Happy Mother's Day to all of you mums out there, wherever you may be...hope you have a lovely day. I'm still often asked why I support the breast cancer charity and it came up yet again in conversation just the other day. 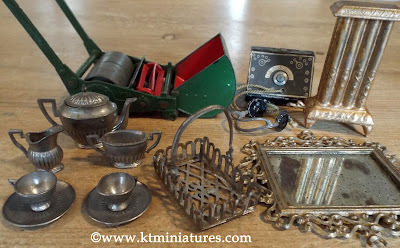 If you click on the following link, it will take you through to a past KT Miniatures Journal, and if you read the first part of that old post - all will become clear - CLICK HERE. The charity Breast Cancer Campaign changed it's name last year when it amalgamated with another charity, so the charity is now called.....BREAST CANCER NOW, of which I am an ardent supporter. 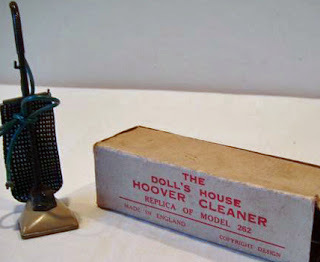 Which leads me onto to say that the donated DCA Dolls House Hoover Model 262 & Box (donated by Malcolm Ambridge - son of one of the three co-founders of DCA) remained unsold after last week's fair, so it will be going up for sale on Monday, unless sold beforehand. All proceeds from the sale of this hoover will be in aid of Breast Cancer Now. 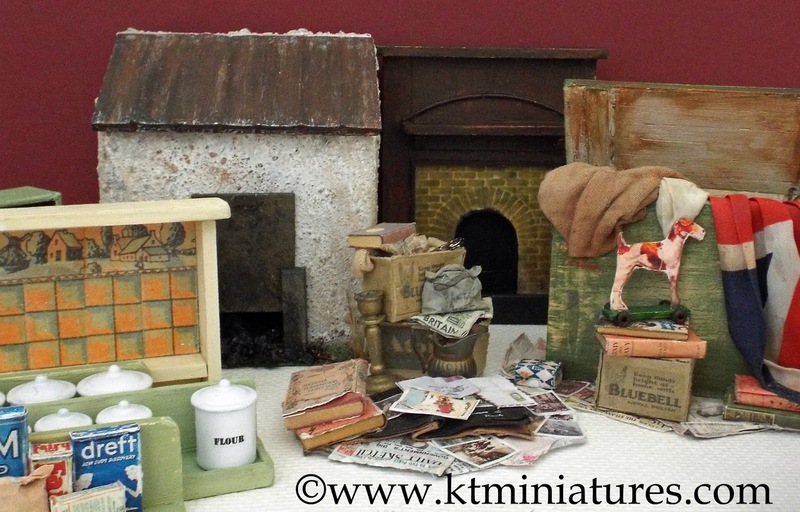 If you are interested in purchasing this before it goes up for sale on KT Miniatures website on Monday, please do get in touch asap. Am delighted to say that the donated DCA Plant Set was sold at Thame Fair for £25.00, which is also in aid of Breast Cancer Now. Nice Day Last Saturday But Now Time To List Unsold Stock! Well that's Thame Dolls House & Miniatures Fair over for another year, but what a great day it was! Thank you to everyone who came on Saturday, we hope you really enjoyed it. Was so nice to meet our customers and we did have some fascinating chats! I understand from the organisers that the total raised for the charity Breast Cancer Now exceeded £3,000 which is amazing. These pics of my stand were taken before the doors opened, with everything set up and in place. 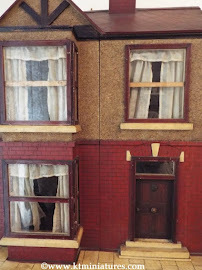 I only had one tiny dolls house this year, an unusual 1930s house with those early Romside windows with bars down each side as hinges. It sold almost straight away and the lovely intrepid new owner travelled back to the Midlands with it tucked under her arm, on a bus and train no less! The little Art Deco wooden display cabinet which I have had for years, sold too and has gone to a really good home - I was quite choked to see it go in the end. 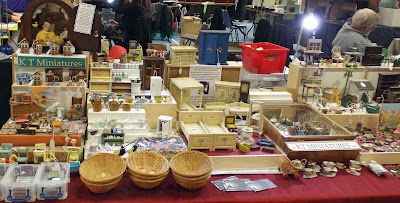 The 1/12th scale prototype Early 1900s Little German Style Shop which is our next workshop, caused quite a stir and great interest, as it sat at the far end of my stand, which was right next to Robin of Coombe Crafts stand (my Nostalgia In Miniature Workshop colleague). My helper (yep - that's my daughter who was enticed all the way back from uni' to help me for the day on the basis that I paid for her return train ticket back up north, chocolate and possibly some sort of wage) arrived a few minutes before the fair opened and she just had time to gulp down a hot chocolate before the fun began! However, as I am now in my 20th year of trading, she is an old hand at this now and I've lost count on how many fairs I have exhibited during that time, often with her behind the stand!! Remember the donated DCA Dolls House Plant Set & DCA Boxed Hoover by Malcolm Ambridge? CLICK HERE FOR MYSTERY OF DCA SOLVED! 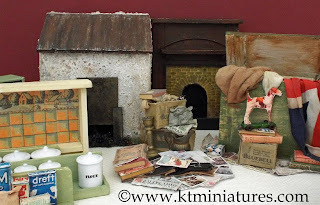 Well, the DCA Plant Set sold for a fantastic £25.00 on Saturday and that will be donated to the BREAST CANCER NOW charity.....but I still have the boxed vacuum cleaner seen above, so if you would like to purchase this, please get in touch with me asap. It will be going up for sale on my website, unless it is sold before - with all proceeds in aid of the charity. some of the gorgeous handpainted furniture by accomplished artist and sculptor Bertha Penrose (Wright) who had connections to the Bloomsbury Set, and her second husband Ralph Wright, for their children. Bertha's brother in law from her first marriage was the English Surrealist painter Roland Penrose. Sorry but some of the pieces seen in the above photo have been sold, but there is still quite a few pieces still available. 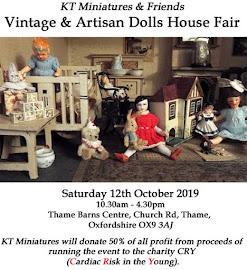 But more about this another day....including my little purchase from Dave of TeenyWeeny Teddies, whose stand was just a few feet away from ours....and a peek at my next project I am working on....all for my own collection, am loving every minute!